The sun was just starting to rise, slowly burning off the dew that had settled on my lawn during the night. The forecast looked perfect, the chance of rain that the weather app on my phone had been teasing me with all week wasn’t expected until later in the afternoon. My freshly brewed cup of coffee was a pleasantry rather than necessity. And, although anticipation had thoroughly ruined my night’s sleep and it was only 6 a.m. on a Saturday morning, I was wide awake. Today was not a run-of-the-mill, mow-your-lawn, trim-the-trees, power-wash-the-driveway, clean-the-garage kind of day off. 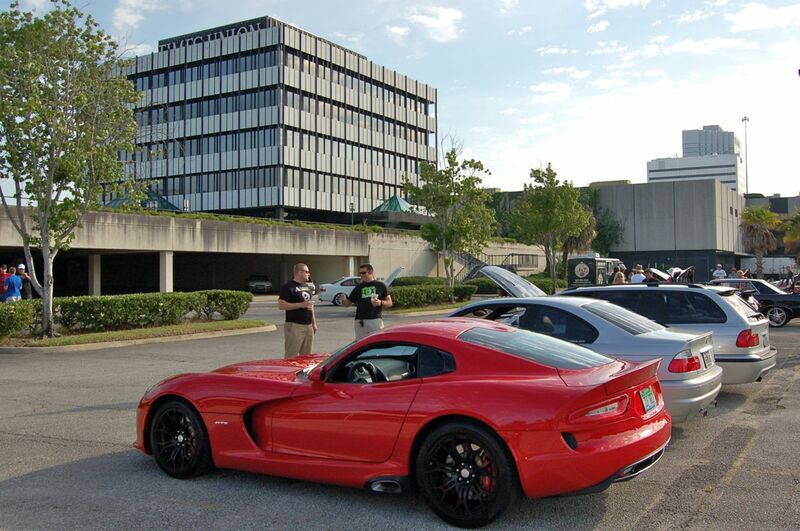 Today was the second Saturday of May — the day that I was going to drive the latest and greatest version of one of my childhood dream cars — an Adrenaline Red 2014 SRT Viper GTS Coupe — to Automotive Addicts Cars and Coffee at the Florida Times-Union headquarters. 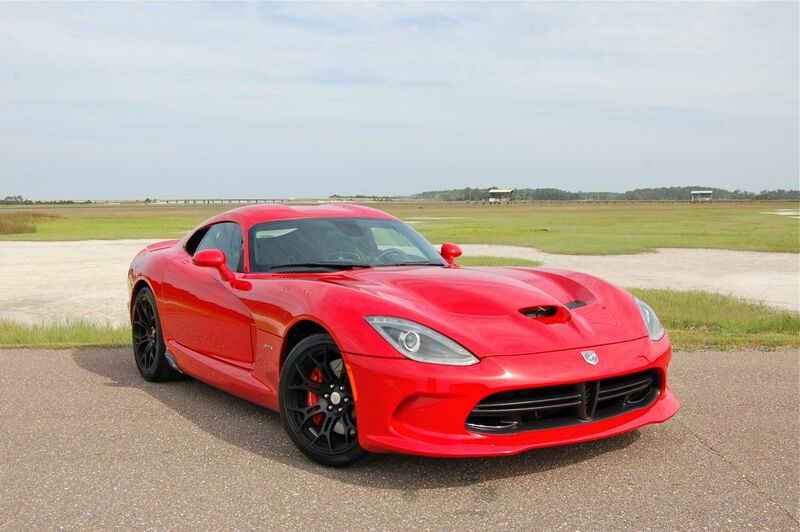 The 2014 SRT (Street and Racing Technology), formerly and soon again to be Dodge, Viper GTS Coupe is an extraordinary automobile. The proportions of the car are almost cartoonish. From the mile-wide rear fenders to the seemingly endless carbon-fiber clamshell hood that enshrouds the fire-breathing 640-horsepower all-aluminum, normally aspirated 8.4L V-10 engine, the Viper is more than the ultimate muscle or sports car; SRT has built an American exotic. At the Automotive Addicts Cars and Coffee show, we try to arrange vehicles into specific areas of the Times-Union parking lot, separating import and domestics and then grouping specific makes and models. I usually leave the house around 7:30 a.m. to arrive about an hour early and help direct traffic. I live in a quiet subdivision, especially on a Saturday morning. 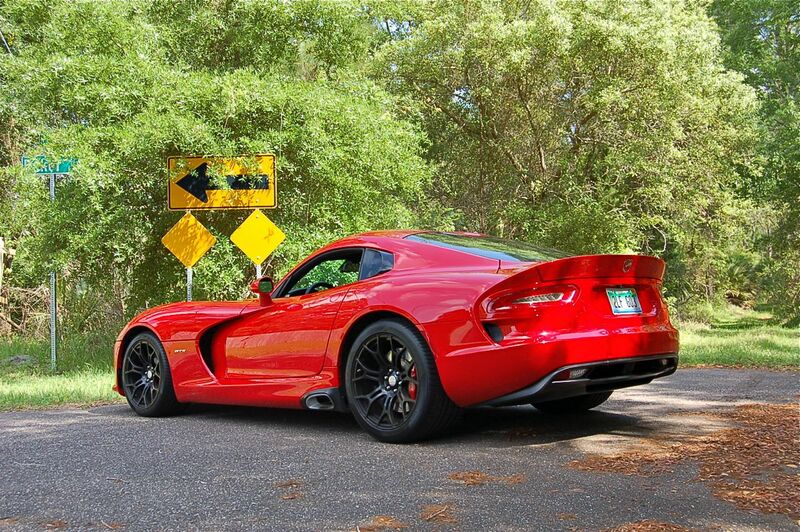 Pressing the start button on the boisterous 2014 SRT Viper awoke not only the car, but everyone within 300 yards of my house. 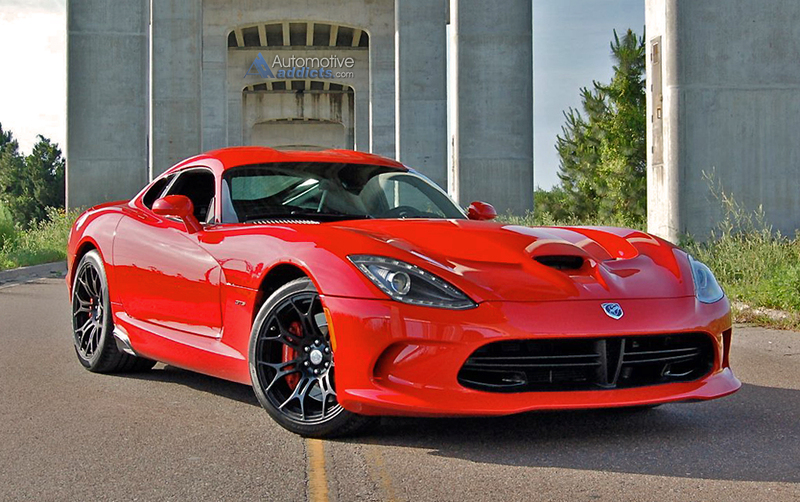 Driving the 2014 SRT Viper is not for the light of heart. 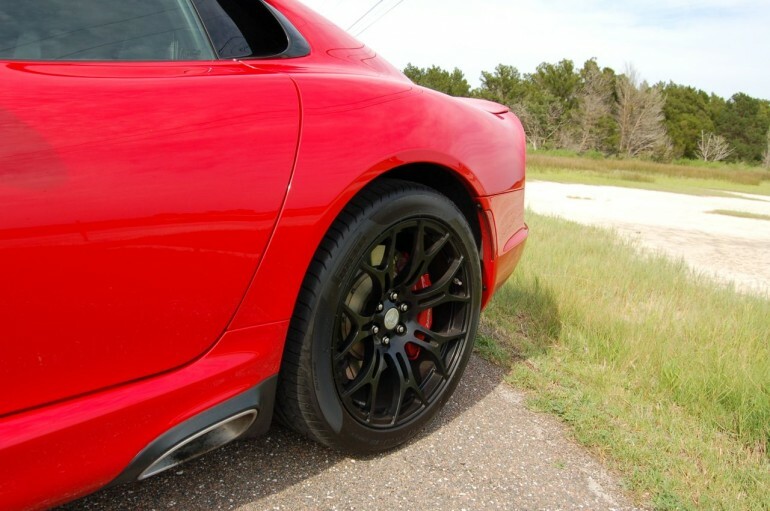 The notchy, short throw six-speed manual is amazing, but driving a car with a heavy clutch and 600 pound-feet of torque on anything but a closed racetrack can be a harrowing experience. 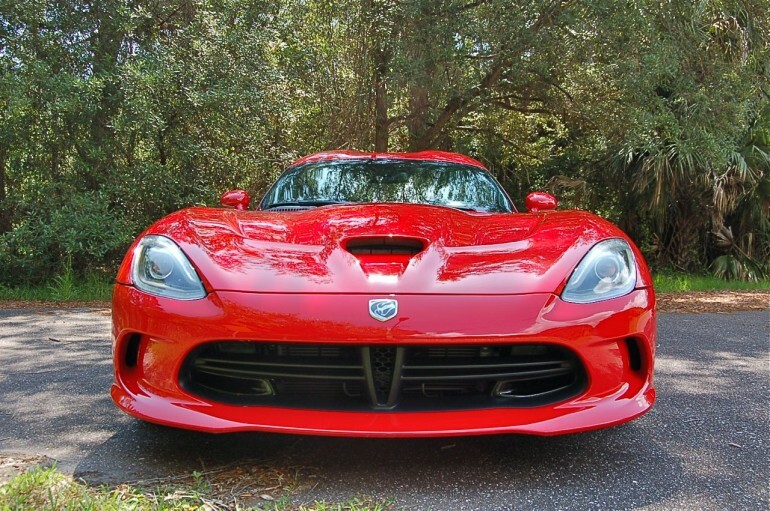 Fortunately, the SRT has long gears and if you carefully feather the throttle, the oft-poisonous Viper behaves itself around town. 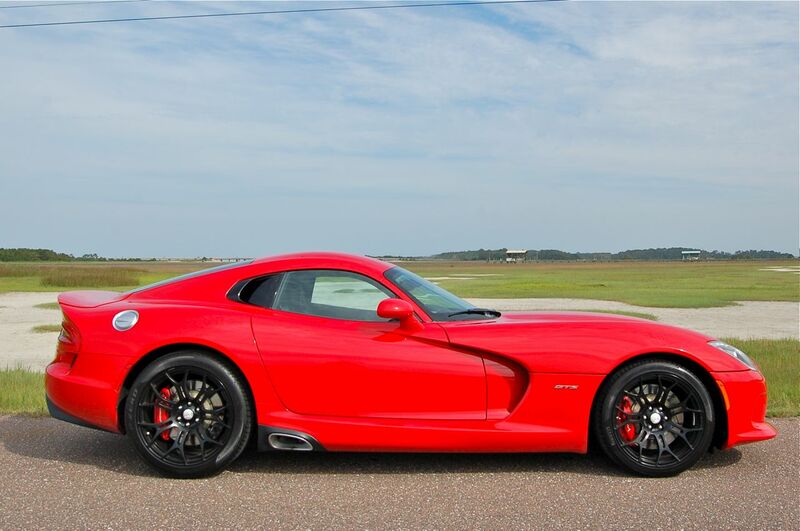 Of course, breaking the tires, especially cold tires, takes very little effort and trying to drive the car at any more than a small percentage of the Viper’s capabilities on public roads can be dangerous, never mind illegal. Make no mistake, this SRT is more refined than previous offerings, but the Viper is more race car than street machine. 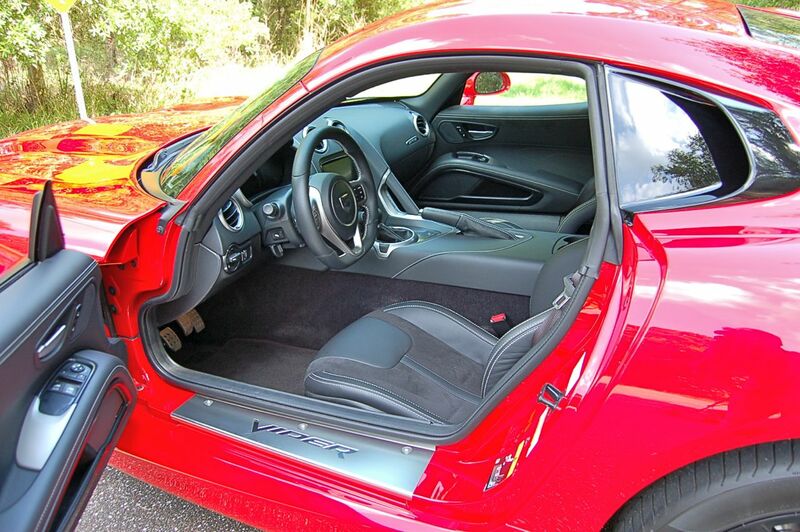 I wasn’t able to take the Viper to a racetrack and really push the car, but I found that while driving around Jacksonville, the braking and handling characteristics of the 2014 Viper were superb. 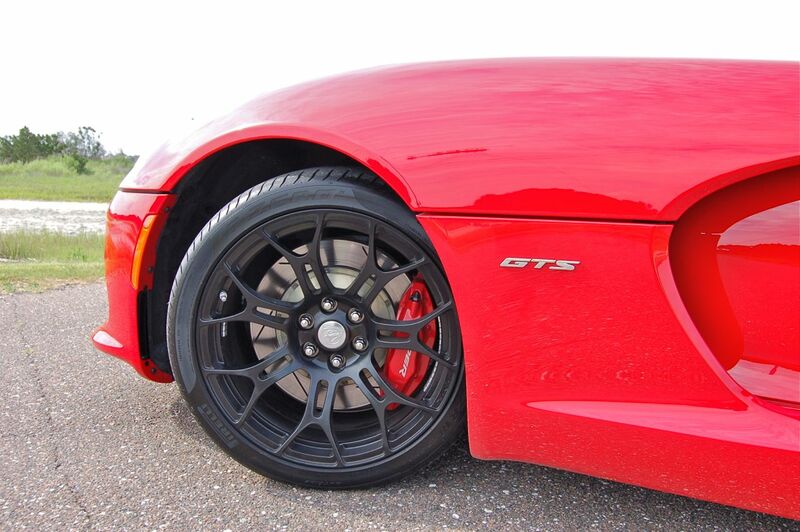 The standard 14-inch vented rotors and Brembo four-piston calipers grab hard and due to the Viper’s aggressive air-ducting, resist brake fade. The traditional hydraulic-assisted rack-and-pinion steering is firm and offers excellent driver feedback. 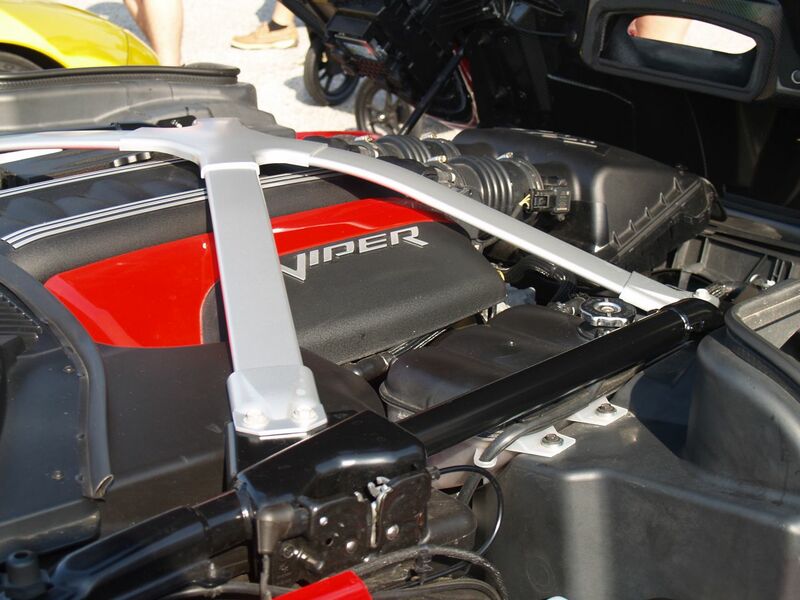 The racetrack ready suspension is comprised of unequal-length upper and lower control A-arms made from rigid cast-aluminum. 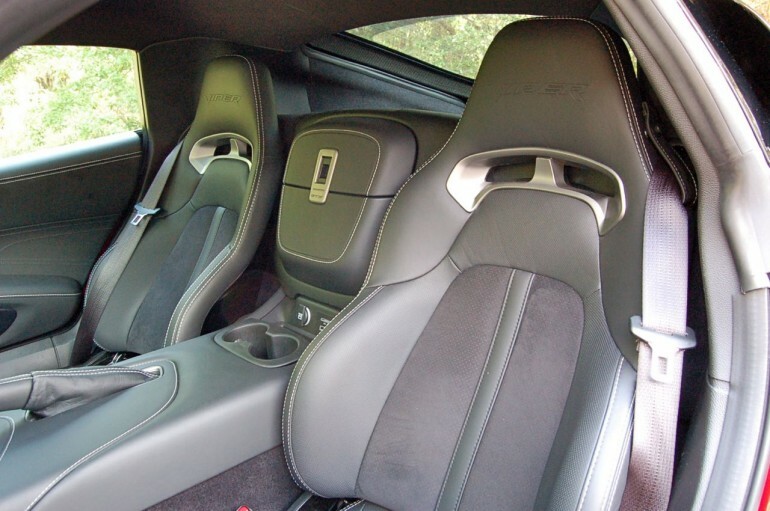 Premium GTS models, like the car I was driving to Cars and Coffee, come fitted with two-mode Bilstein DampTronic shock absorbers that allow the car to go from a moderate “tight and clingy” to an “I just felt it when I ran over that penny” level of ride firmness. After driving with the Race option on for a while, pressing the Street button feels like you are riding on a cloud. 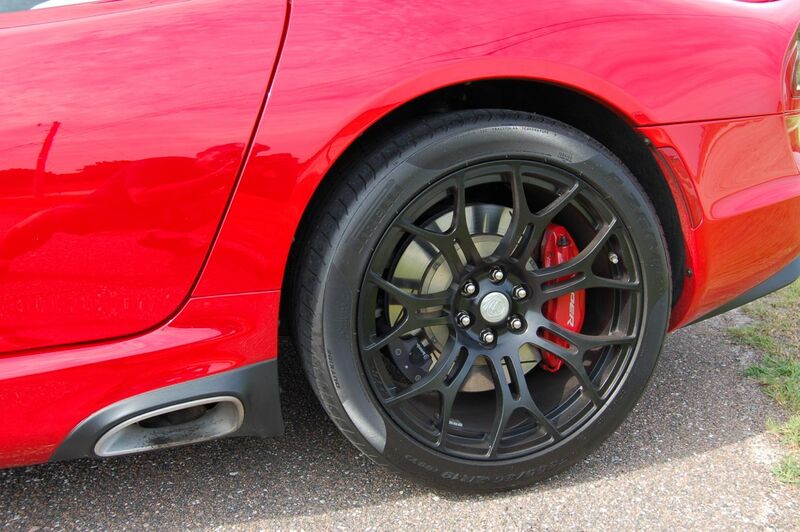 The GTS Coupe offers five stability control configurations including On and Off, Sport, Track and Rain. 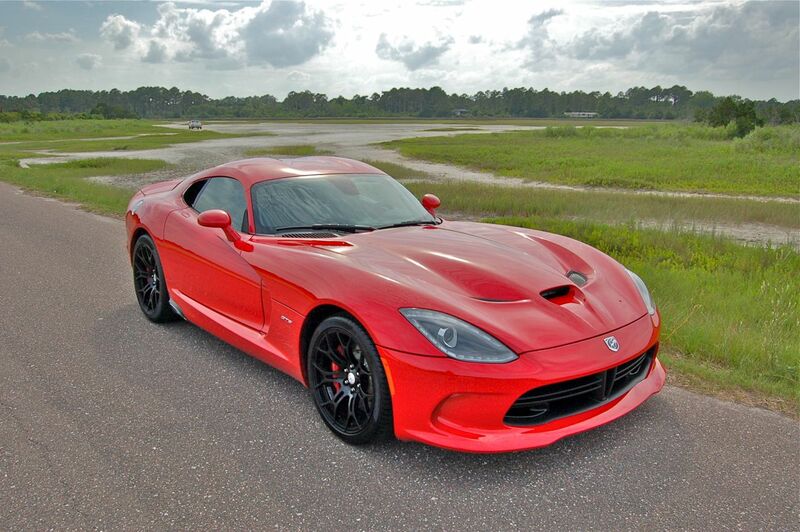 The rain mode is new for the 2014 model and attempts to give the Viper a fighting chance of not spinning the tires relentlessly on wet roads. 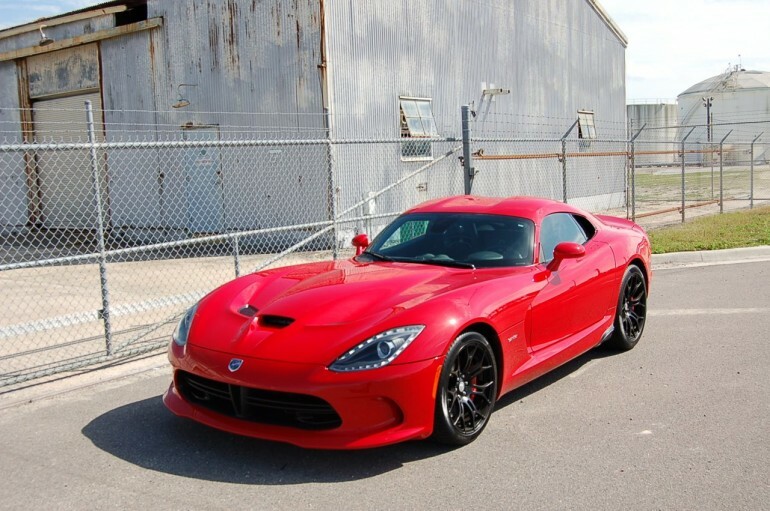 I can assure you that the Rain mode does help but, in my opinion, the Viper is better off staying in the garage when the drops are falling. 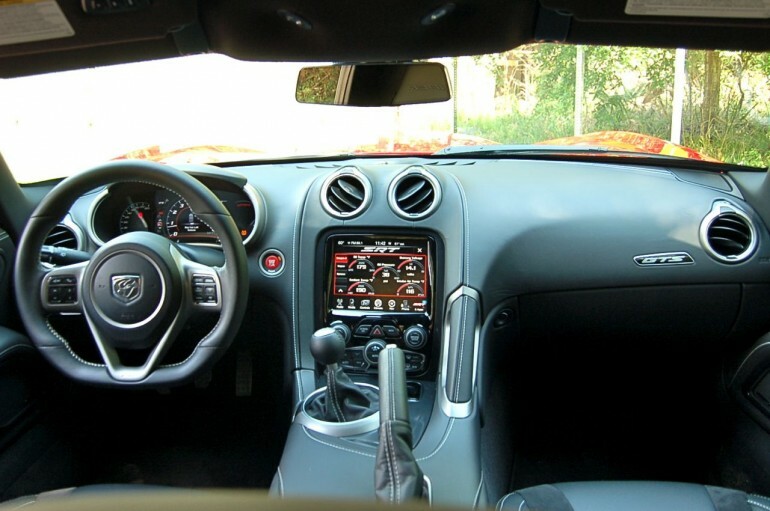 Complementing the Viper’s well-appointed interior is the optional 900-watt Harmon Kardon-designed SRT high performance audio system featuring an 8.4-inch LCD touch screen, 14 speakers and four subwoofers. 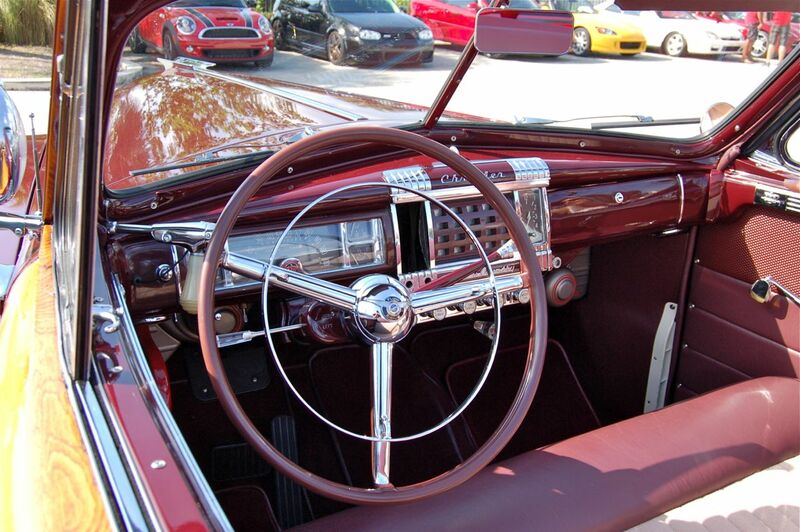 Unfortunately, with the side pipe exhaust less than a few feet from your ear, the magnificence of this sound system is often lost when driving, even with the windows tightly closed. 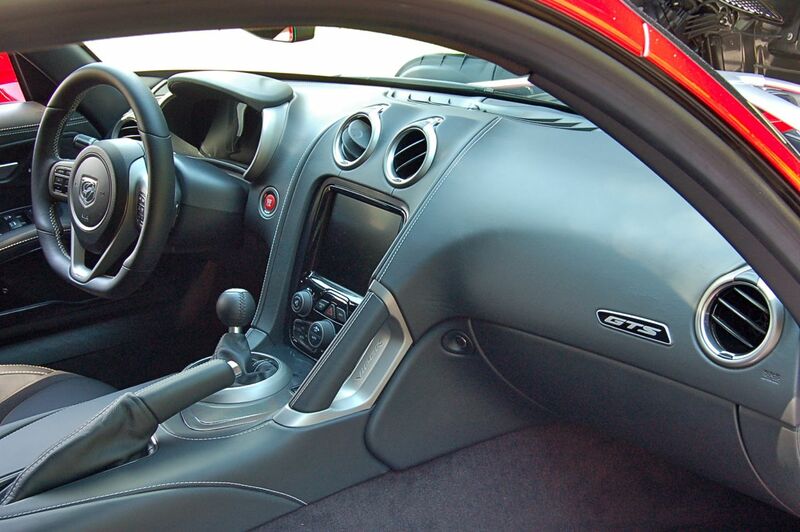 However, when the engine is off and the system is linked to a Bluetooth enabled audio device, the depth and clarity of the audio is as exciting as driving the car itself. 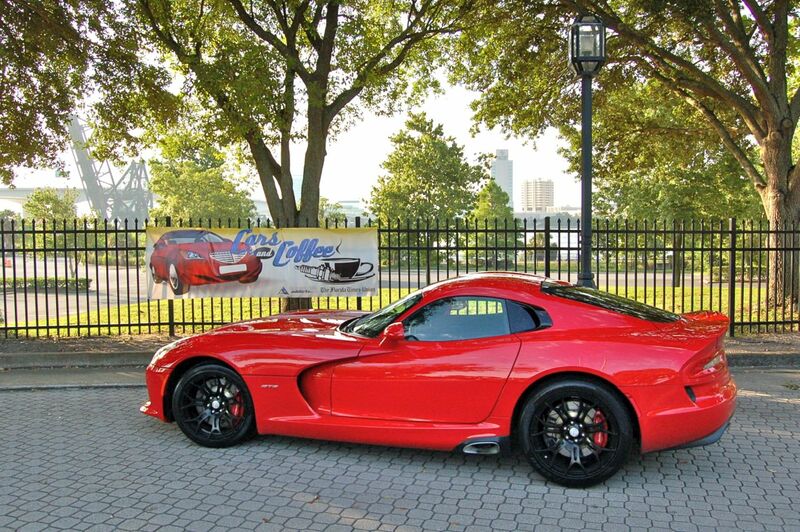 The 2014 SRT Viper was a hit at the Cars and Coffee show. I always enjoy watching the expression on people’s faces when they first see the car. 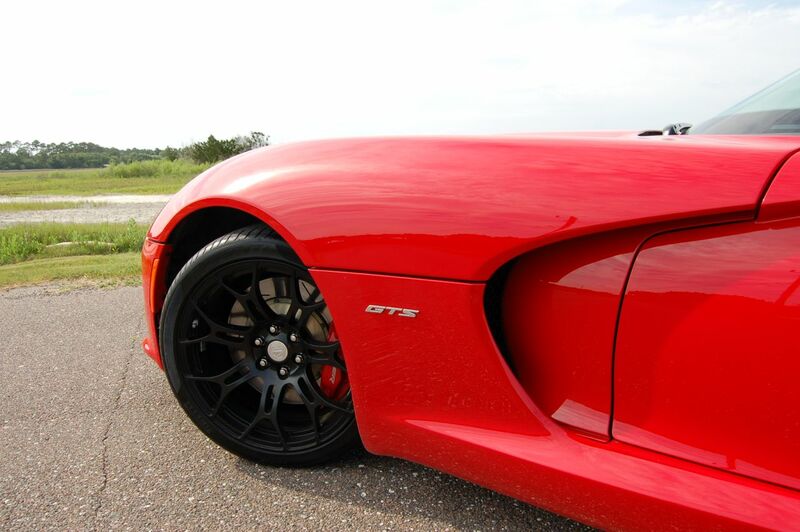 The over-the-top proportions and the deafening sound of the V-10 motor are enough to form a crowd single-handedly. Thankfully, the Viper didn’t have to. 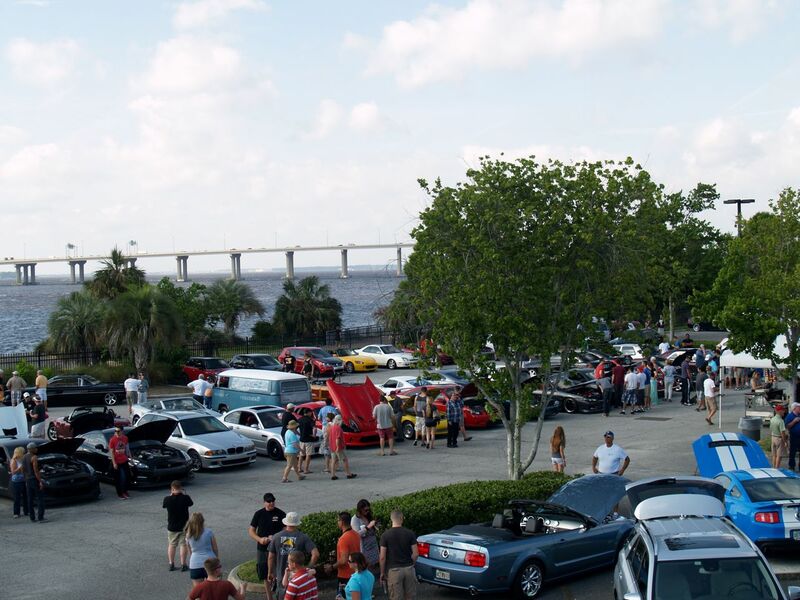 With a record-breaking estimate of almost 500 vehicles in attendance, there were plenty of equally exciting cars, trucks, SUVs, and motorcycles for everyone to enjoy. 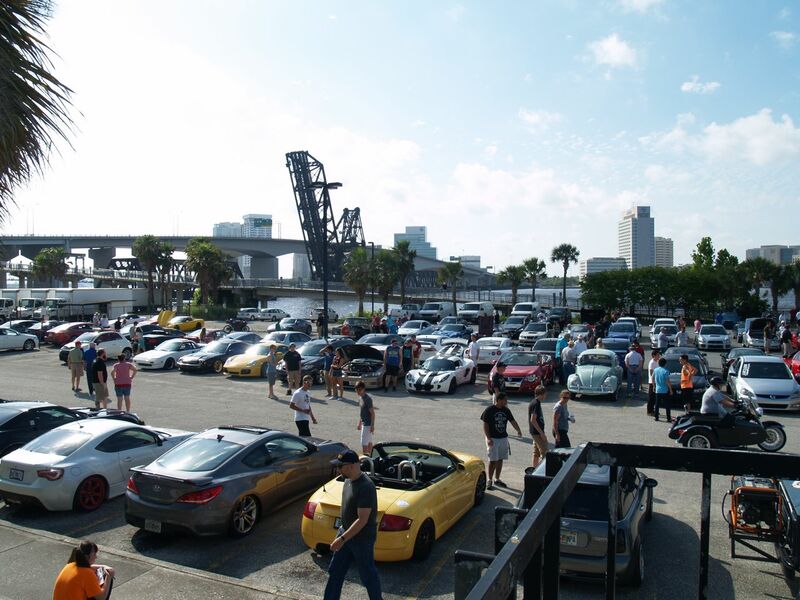 Six BMW M3s, five Nissan GT-Rs, four 2014 Corvette Stingrays, three Subaru BRZs, a couple of Maseratis, and a rough-and-tumble 1965 Land Rover made their way downtown. Many thanks to everyone who participated and to all the volunteers who helped make the event possible. 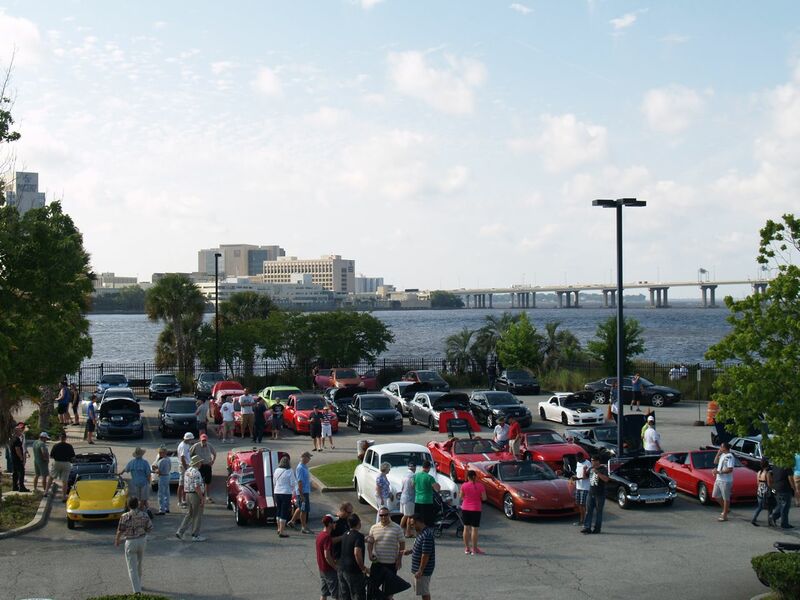 I would love to see your ride at the next Automotive Addicts Cars and Coffee at the Times-Union — June 14 from 9-11 a.m.